A KOTOBUKIYA Japanese import! 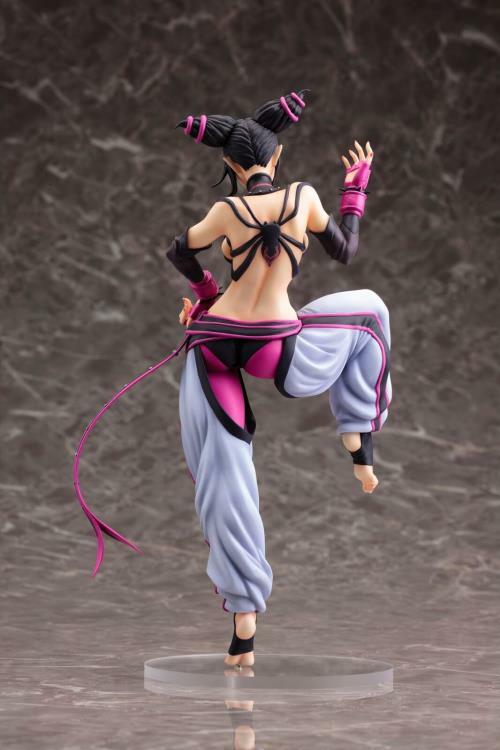 Kotobukiya continues its new line of incredible S treet Fighter Bishoujo statues, bringing the beautiful and provoc ative JURI to join previously released Chun Li and Cammy! One of the bestselling video game franchise s of all time, Street Fighter first debuted in 1987 with its unique blend of one on one combat and inte rnational characters (and fighting styles). After visiting the Chinese and British ladies, we travel to South Korea for the taekwondo expert and member of S.I.N. who is well known for her impressive kick at tacks as well as her Feng Shui Engine eye. Juri ha s never looked better than in this new Bishoujo prese ntation based on an all new illustration by Shunya Yamashita! The quick and powerful fighter stands balanced grac efully on one foot, her other leg raised and ready to unleash a devastating, lightning fast kick! Juri l ooks incredible in a pose that really shows off her physique as well as her unique fighting outfit. Th at consists of billowing pants with cutout sections , a wide sash belt, unattached sleeves with fingerless gloves, and her distinctive chest harness. All of the clothing matches her iconic color scheme in black a nd bright purple with white on the pants and skull belt buckle. The detailing on Juri is incredible, with small notes like the threading of the sash, the riv ets on her chest piece, the padding and spikes on her glov es, and of course her hair wrapped up into twin cones. Raising one hand to beckon you while the ot her rests on her hip, Juri looks at you teasingly w hile sticking out her tongue! Sculpted by Masahiro Takahashi (Gill Gill), Juri st ands over 9 ½ inches tall (1/7 scale) on a specially designed display base. 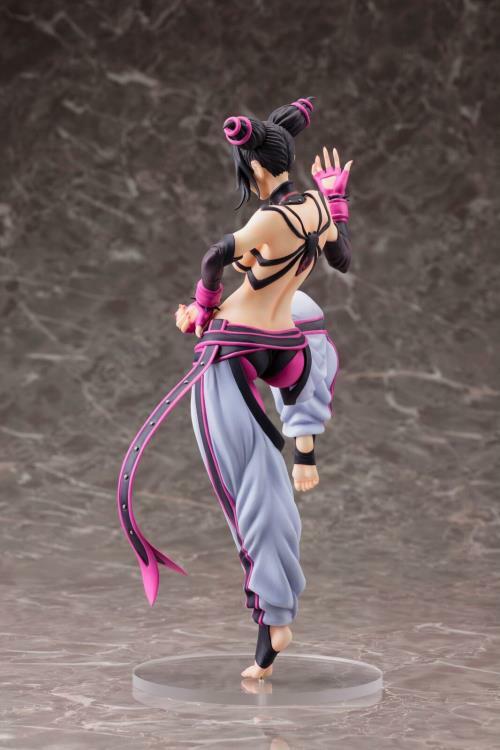 Display Juri on her own or alongside other Street Fighter Bishoujo statues lik e Cammy or Chun-Li!